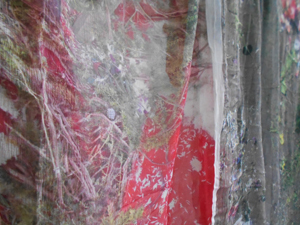 As part of its “Feature” exhibition series, the gallery is displaying a range of scarfs from the series Ecstatic, Even by Laura Letinsky (b. in 1962 in Winnipeg, Canada). 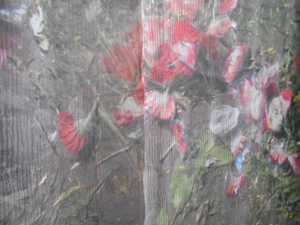 The fabric is printed with photographs taken by the artist at various locations in and around Mumbai, including the flower market in Bangalore and a wedding marquee the day after the festivities. The scarfs, which have been slung over a wooden pole in this exhibition, may be touched and moved by visitors. Rather than conveying the original state of the respective piece of ground photographed, the pictures have been montaged into new compositions by the artist through manipulations in framing and perspective along with image editing. This photographic intervention is however not readily discernible in the works. At first glance, it appears as though the ground is depicted just as the artist found it. Only upon closer examination does the balanced arrangement of objects betray the collage technique. The process of collection, collation and collage is deeply ingrained in Laura Letinsky’s work. The artist uses items such as dishes, fruit and plastic objects to compose her still lifes. Additionally, magazine clippings and Letinsky’s own working prints appear in works such as Ill Form Void Full. With an extensive stock of photographic material at her disposal, Letinsky employs space, light and color to create an unusual image of photographically captured reality – as exemplified in Ecstatic, Even. As an added feature here, the nature of the cloth used for this series is interesting in relation to the photographic content. Silk chiffon and cashmere are luxurious fabrics that are soft and tempting to the touch and are worn close to the body in the form of scarves. When juxtaposed with images featuring scenery such as a gritty, dirty floor, for example, a paradoxical effect is achieved: we reach out to touch things that have been thoughtlessly cast aside and submerged in the dust on the ground. 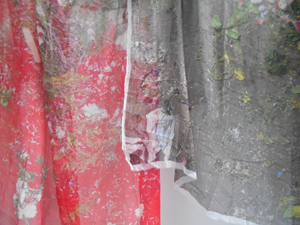 It is also compelling to observe the widely divergent effects produced by the images in combination with the two different materials: while the light and translucent silk chiffon scarves capture the light, the cashmere ones appear soft and opaque.